Canine hip dysplasia is a fairly common condition that you see a lot in larger dog breeds, but smaller dogs breeds can develop it as well. Hip dysplasia occurs when your dog's ball and socket joint in their hip develops incorrectly and grinds or rubs together instead of glides. This condition can drastically decrease your dog's overall quality of life, and there are five telltale signs of canine hip dysplasia you want to watch for. These signs can worsen over time, so early detection and treatment are key. One of the easiest 'tells' or signs that something is wrong with your dog's hips is a decreased activity level. You may notice that your dog wants to rest or sleep more, and they'll be less enthusiastic about activities that make them physically active like going on walks or playing. A lot of pet parents may assume that this is simply a consequence of their dog getting older. 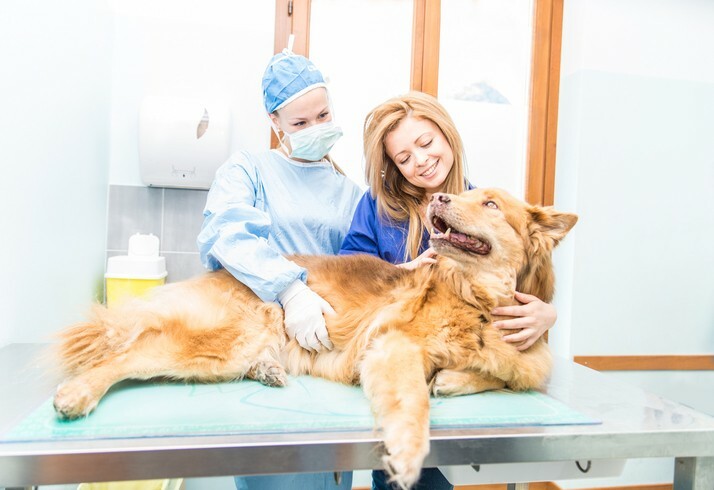 However, it is very important to mention any radical change in your dog's behavior like decreased activity to your vet because your dog may be in pain and you don't want them to suffer. As canine hip dysplasia worsens over time, you may notice that your dog has difficulty rising after they've been laying down or in a prone position. It can be noticeably worse in the morning after your dog wakes up from sleeping all night. They may also have more difficulty getting up after they've been laying on cold, hard, or slippery floors. Carpeting or area rugs is one way to help your dog, and it can also give them better traction, so they don't slip and fall as they're walking around. Your dog uses their back legs to push themselves up the stairs, and as hip dysplasia advances, their hips become inflamed and sore. This can directly impact how well your dog can climb stairs or jump up because your dog's range of motion in their hips decrease. In the beginning, when the inflammation first starts to develop, you might start to notice that your dog hesitates when they have to climb stairs or jump up. This hesitation can lead to your pet refusing to climb the stairs or jump up completely, or they won't do it without assistance from you. The term "bunny hopping" is referring to the way your dog changes their gait when they walk, climb stairs, or run. It got its name because dogs tend to "hop" and lift both of their back legs at once when they're moving to decrease the pressure on their joints. If your dog is lifting and putting down both of their back legs at the same time, it can make them distribute their weight more evenly, and this can make it less painful to move around. They may also lead with the opposite leg when they climb stairs. A final indicator of hip dysplasia is that your dog displays signs of pain when you or one of your family members touches their hip area. When hip dysplasia starts to develop, the ball joint can pop out of the socket and cause tiny fractures to appear and the joints to stretch to accommodate it. As this problem develops, these tiny fractures and stretching turns into cartilage breakdown and eventually to osteoarthritis. This can make your dog's hip area very painful, and they may shy away when you try to touch the area. Your dog is more than a pet, and you want them to have as happy and as healthy of a life as they can, for as long as they can. This is why it's so important to monitor your dog for any changes in their behavior and talk to your vet if you have concerns. If your dog develops hip dysplasia, early detection and treatment can help to improve your dog's quality of life. They'll be happier and healthier well into their old age. 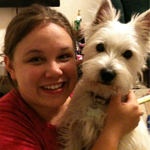 Ashley Turner is a Dog Mom of a beautiful Westie named Lily. She also happens to be the community manager and blogger for PuppyWire. Her passion is to help other Dog Parents by giving them practical advice through tips, guides, and reviews for popular dog products. Find out more by visiting PuppyWire.com.